This fall at King’s High School, we began implementing our new 1-to-1 computing program with Microsoft Surface Pros. This new requirement for ninth and tenth grade students will allow our teachers and students to fully leverage Office 365 tools and apps, equipping our students with technological adeptness they will be able to use in college and their future workplaces. One of the terrific bi-products of having a 1-to-1 program is that our students learn pivotal corporate skills in a seamless way right alongside academics. They learn to apply high level computing skills as they collaborate with teachers and other students, giving them virtual “on-the-job training” within their classrooms. They also gain cutting-edge skills like digital inking, capacitive touch/active stylus, 3D digital technology, etc. Until recently, most high schools have used a computer lab model rather than 1-to-1 in which every student has their own device. 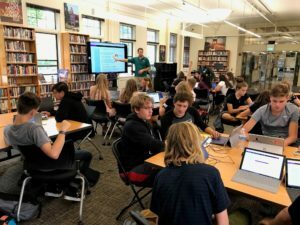 Local schools like O’Day High School, Seattle Prep and some public schools (Lake Sammamish, Kent and Aberdeen) have already moved to a 1-to-1 model. While this requirement can initially stretch a family’s finances, at King’s, we allow students to bring any Surface Pro 3 and above generation, refurbished or new, which allows for a wide range of prices. Even though some corporations are moving toward versatility of devices in the workplace, most still use Microsoft products and software. For schools, there is a benefit of having everyone use the same protocols and devices: It’s easier to support and more collaborative as we no longer run into the issue of compatibility, whether it’s software or hardware. 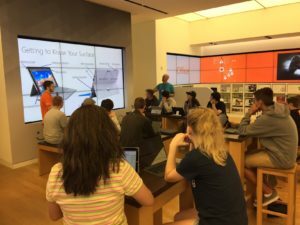 Microsoft has been great to work with, providing in-person tech support and offering discounts to students and families. Microsoft has even helped to train our student technology support staff, which is now a class at King’s. 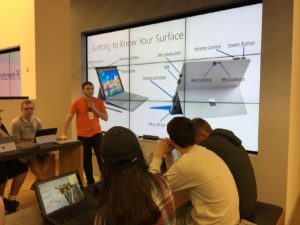 These students learn how to support Surface Pro devices as well as learn valuable on the job training as one in the desktop support world would encounter. We have also set up a website at www.tinyurl.com/kingstechnology with step-by-step training videos and problem solving tips to help students, parents and faculty with their new Surface Pros. Our hope is that this program will properly equip students to learn how to effectively manage their own devices in the future. With our hybrid approach of minor school management coupled with device autonomy, students will be well versed in troubleshooting and managing their own devices when they get to college. In addition, the digital practice of saving everything to the cloud and online assignment submission will practically prepare all our students for the modern college class which requires all the fore mentioned skills.